Coffee, tea, red wine, soda, and fruit juice are some of the most common causes of teeth stains, but they aren’t the only ones. The fact is aging plays a part in the staining process, too. As we age, our smiles will lose some of their gleam. But thankfully, with a cosmetic dentistry service like teeth whitening, patients can turn back the clock on their smiles and enjoy better self-confidence. At Dr. S. John Salivonchik’s dental office in Whitehall, we can provide you with custom-made bleaching trays that will allow you to brighten your smile in the comfort of your own home. Research shows that take-home whitening is more effective than in-office whitening systems like Zoom. Here’s what you can expect. First, Dr. Salivonchik will look at the stains on your teeth to see if you’re a good candidate for teeth whitening. If you are, a set of custom-made whitening trays will be made based on an impression we take of your teeth. When your trays are ready and you have your whitening gel, getting results will be as simple as wearing your gel-filled trays daily for just a short amount of time. Within one or two weeks, you’ll see the dazzling results you’ve been looking for. In addition, all fees for teeth whitening are donated to The Children’s Cancer Research Fund and Brenton’s Hope. 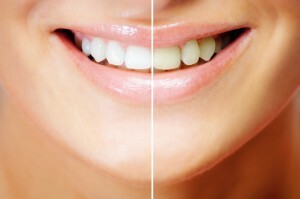 Do you want to know if teeth whitening is right for you? Call our Whitehall dental office for a consultation with Dr. Salivonchik. We’re happy to provide patients from Whitehall, Allentown, Bethlehem, Easton, The Poconos, and beyond with the anti-aging benefits of teeth whitening.